FAN VOTING: Click here to vote once per day, per email account through March 29 for Bassey for National Center of the Year! SPRINGFIELD, Mass. — WKU Hilltopper Basketball freshman center Charles Basseyhas been named 1 of 5 finalists for the 2019 Kareem Abdul-Jabbar Center of the Year Award, as announced Friday by the Naismith Memorial Basketball Hall of Fame. Named after Class of 1995 Hall of Famer and three-time NCAA Champion Kareem Abdul-Jabbar, the annual honor in its fifth year recognizes the top centers in men's college basketball. A national committee comprising top college basketball personnel determined the watch list of 21 candidates in October and narrowed that list to 10 in February before trimming to five this week. "I'm proud to be a finalist for an award named after one of the best to ever play this game," Bassey said. "It's an honor to represent my school in this way, and I couldn't have grown as a player over this season without my teammates and coaches." This month, the five finalists will be presented to Mr. Abdul-Jabbar and the Hall of Fame's selection committee. The winner of the 2019 Kareem Abdul-Jabbar Center of the Year Award will be determined by a combination of fan votes and input from the Basketball Hall of Fame's selection committee. Fans are encouraged to visit www.HoophallAwards.com to cast their votes March 8-29. The other finalists are Wisconsin's Ethan Happ, Maryland's Bruno Fernando, Georgetown's Jesse Govan and William & Mary's Nathan Knight. Bassey is the only freshman finalist. Bassey – a 6-foot-11, 245-pound native of Lagos, Nigeria – is averaging 15 points, 9.9 rebounds, and 2.4 blocks for the Hilltoppers while shooting 62.9 percent from the field. He leads Conference USA in double-doubles (15) and ranks in the top 30 nationally in double-doubles, field-goal percentage, blocks per game, total blocks, rebounds per game, defensive rebounds per game and total rebounds. Bassey is the only player in the nation this season with 308 rebounds, 74 blocks and 27 steals. He could become just the second freshmen since 1992 – along with Greg Oden – to average at least 14 points, nine rebounds and two blocks while shooting at least 60 percent overall. The center has been named C-USA Freshman of the Week nine times and has more blocks by himself this season than 69 Division I teams. He's also played his best basketball against top competition, averaging 17.8 points, 10.4 rebounds, 2.6 blocks and 1.4 steals in five games against Wisconsin's Happ, Arkansas' Daniel Gafford, UCF's Tacko Fall, West Virginia's Sagaba Konate and Washington's Noah Dickerson. 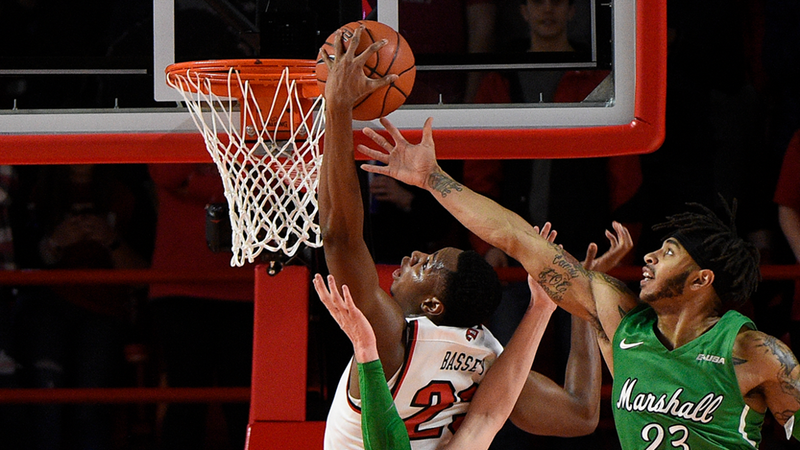 Bassey tallied 19 points on 7-of-8 shooting along with six rebounds and four blocks against fellow finalist Happ in WKU's 83-76 win over Wisconsin in December. Happ finished 9 of 23 from the field. Bassey has done all of this after just turning 18 years old on Oct. 28 and while maintaining a 4.0 grade-point average. The winner of the 2019 Kareem Abdul-Jabbar Award will be presented at The College Basketball Awards presented by Wendy's in Los Angeles, Calif., on Friday, April 12, along with the other four members of the Naismith Starting 5. "The Naismith Starting 5 is an opportunity for the Hall of Fame to annually celebrate the best in the college game," Abdul-Jabbar said. "We've had some really remarkable winners over the past four seasons and I look forward to meeting this year's winner in Los Angeles." "Kareem Abdul-Jabbar built a legacy at UCLA with unparalleled accolades as an individual and as part of a championship winning team," said John L. Doleva, President and CEO of the Basketball Hall of Fame. "To be acknowledged as a finalist for the award that bears his name is a remarkable honor and I hope these student-athletes feel a great sense of pride." For more information and the latest updates on the 2019 Kareem Abdul-Jabbar Award, log onto www.hoophallawards.com and follow @hoophall and #KareemAward on Twitter and Instagram. SPRINGFIELD, Mass. — WKU Hilltopper Basketball freshman center Charles Bassey has been named 1 of 10 candidates for the 2019 Kareem Abdul-Jabbar Center of the Year Award, as announced Friday by the Naismith Memorial Basketball Hall of Fame. Named after Class of 1995 Hall of Famer and three-time NCAA Champion Kareem Abdul-Jabbar, the annual honor in its fifth year recognizes the top centers in men's college basketball. A national committee comprising top college basketball personnel determined the watch list of 21 candidates in October, which has now been narrowed to just 10. Bassey – a 6-foot-11, 245-pound native of Lagos, Nigeria – is averaging 14.5 points, 10.3 rebounds and 2.3 blocks this season while shooting 63.1 percent from the field. He leads Conference USA in both rebounding and double-doubles (12). The big man is 1 of 2 freshmen in the country averaging a double-double. Bassey ranks in the top 40 in the country in double-doubles, field-goal percentage, blocks per game, total blocks, rebounds per game, offensive rebounds per game, defensive rebounds per game and total rebounds. He's 1 of 2 freshmen on the list of candidates, along with UCLA's Moses Brown. In March, five finalists will be presented to Mr. Abdul-Jabbar and the Hall of Fame's selection committee. The winner of the 2019 Kareem Abdul-Jabbar Award will be presented at The College Basketball Awards presented by Wendy's in Los Angeles, Calif., on Friday, April 12, along with the other four members of the Naismith Starting 5.